Part of a private collection in München, this work is catalogued on the artist’s website as Farbguss (Rubin) 2009; Pigment, PUR, 64 kg. And with the kilogram measurement (not centimeters!) the questions flood in. Ideas begin to flow, to eddy, to stream. The metaphor is liquid. The liquid is metaphor. Had these 64 kilograms of color been poured in any other place, they would have found a different form. The walls of this corner dictate two straight lines. The short rectangular wall thrusts its ninety-degree angles into the liquid. The bright orange-brown of the wood floor and of the molding frame the ruby pool. The amount of the liquid, its viscosity, and its surface tension determined how far from the wall it eventually spread. When sculptors pour liquid into a mold, the casting results in an object soon isolated from the process. Splitt’s colorpour is interesting precisely because it was poured. The mold, both where it limits and where it opens up to allow the liquid to fan out, is part of the work. The rounded edge retains the fluid form of its origin. To look at the irregular quarter-round is to see the movement that created it. Puddled there, spread out there, waiting there, the still pool still manifests the form of motion. Because it is flat, and because of the nature of its polyurethane/pigment mixture, the pool acts as a mirror. The reflected and surrounding room becomes part of the work. Every artwork does this to some extent, but the colorpool’s position on the floor and its reflecting surface highlight the relationships. The slightly distorted reflection of the railing, for instance, both reimagines the railing and reveals the less-than-perfectly flat surface of the pool. 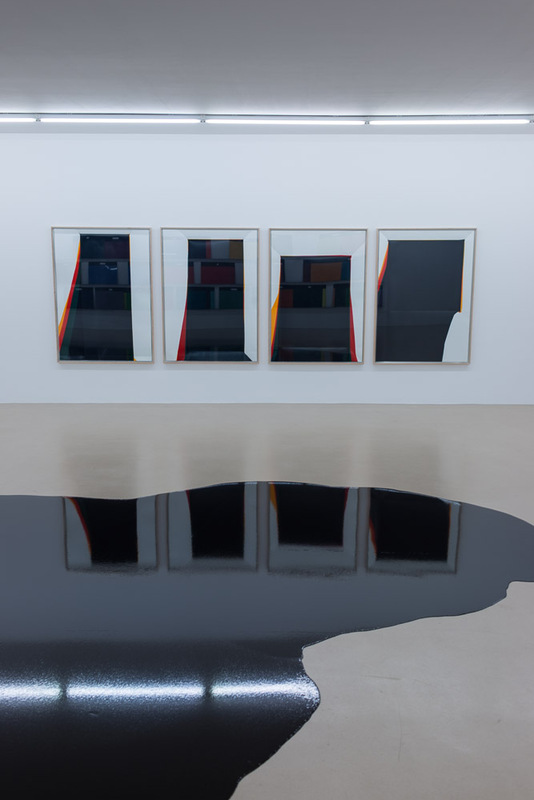 Exhibited in a space overlooking a high-ceilinged gallery of abstract paintings, the ruby colorpool points (yes, points—another aspect of its corner position) at a striking work below: a white-on-black painting instantly recognizable as by Julije Knifer. Like the colorpool, the painting is a study in form and motion. Knifer called these obsessively repeated and varied forms meanders. A meander exists in space. To meander is to move through space and thus through time. In a viewer’s perception, Knifer’s meanders snake across the canvas in sometimes regular, sometimes syncopated geometrical rhythms. I once described my experience with several of Knifer’s meanders as “seeing jazz” (Julije Knifer, ed. Žarko Radaković (Stuttgart: Flugasche, 1990)). In a viewer’s perception, Knifer’s fixed form comes alive. In the context of Knifer’s motion of form, Splitt’s ruby pool can be seen as the inverse, as a form of motion. Gilles Deleuze wrote that for Henri Bergson duration is “. 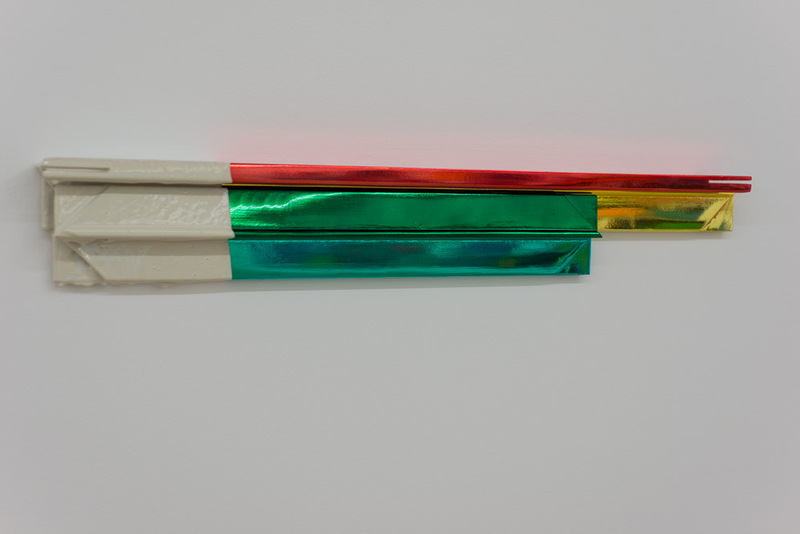 . . change that is substance itself.” Rainer Splitt’s works, as I see them, are about the substance of change. The photographs below, for example, taken by Christian Ring of the Rainer Splitt exhibition at the Museum gegenstandsfreier Kunst, Otterndorf, reveal a group of works engaged in a shifting conversation about fluidity, about motion, about change, and about duration. 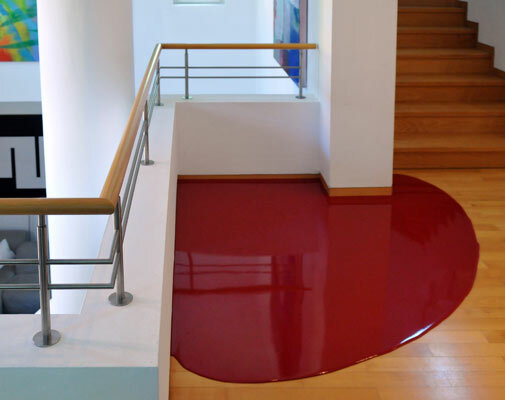 The black pool exhibits all the characteristics of the ruby pool, although this colorpour is not bounded by anything other than its own volume, its viscosity, its surface tension, and, of course, the floor. The works on the wall, folded paper in which yellow and red and black paint has been pooled and then poured out, hang over the colorpour as if they were the source of the blackness. They seem like windows opening onto a viscous black universe that floods through them and into the room. 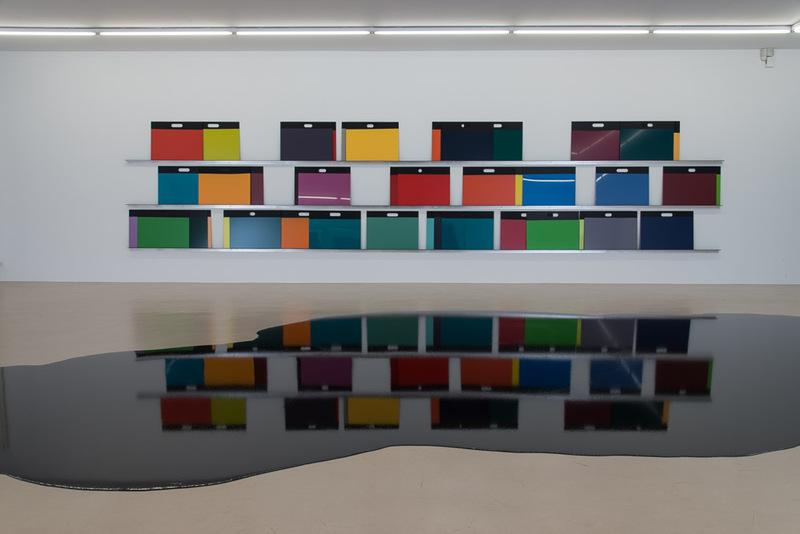 The glass protecting the paperpools reflects three rows of colorful boards across the room, boards dipped in paint, still bearing along their bottom edges congealed drips. Turning to look across the pool at those boards, as in this second photo, one encounters an explosion of color. Yellow and red and blue and green and orange and purple rectangles stand on railings against the wall, their brilliance doubled in the pool’s reflection and their own surfaces reflecting the hyphenated light fixtures above. If viewers take boards from the wall (and they have handles to facilitate this), carrying them through the room as they view the pool from various angles, the room is in flux. That fluctuating motion is the essence of the installation: the drips, the pours, the pool, the moving boards, the shifting perspectives. In concert, Rainer Splitt’s works perform “a becoming that endures, a change that is substance itself.” This is the form of motion. Duration on display. On a third wall in this room hangs a dismantled frame, four bundled, paint-dipped, and brilliantly wrapped sections of molding. The protective border, the static decorative receptacle, the surrounding guarantor of stability and strength hangs out of the way on the wall, disassembled and banished to the far reaches of the conversation so the other works can slide in and out of relationships bounded solely by gravity. Color has flowed directly over paper. Color has streamed unhindered onto the floor. Color has enveloped the dipped boards. The motion of that color is reflected and repeated in a doubling and redoubling exhibition of flux. That flowing, that streaming, that enveloping motion is the subject and object of this exhibition. The greenish rush of it. As viewers of Rainer Splitt’s rendered time, we stand outside the horizontal rush of it, and at the same time (different time?) we have the glorious sensation of standing within the formal flux of time and space and COLOR! Addendum: Nina Pops pointed out that the painting hanging above Knifer’s in the Munich collection, also pointed to by the ruby pool, is by Gerhard Richter, and thus the circle is closed. This entry was posted in Uncategorized and tagged colorpours, duration, Farbgusse, Gerhard Richter, Gilles Deleuze, Henri Bergson, Julije Knifer, Rainer Splitt, Robert Hass, Zarko Radakovic. Bookmark the permalink.